First stop: Lisboa ! Between the nonchalant Southern way of life, the sound of Fado coming out of a local restaurant, the unique Azulejos mix 'n match on the façades, the colorful streets of the Portuguese capital haven’t failed to surprise us. Here's our top 5 addresses to make the most of your trip. Located in the quiet neighbourhood of Graça, “Mi Casa En Lisboa” definitely feels like a home in Lisbon - a welcoming and cosy one. The owner and design journalist Maria Ulecia has decorated each room with a high sense of detail, mixing vintage and design objects. Add to this a great selection of books and magazines, a ton of advice and tips on the area and a delightful homemade breakfast and you get the perfect place to drop your luggage during your stay in the city. Ancient manufacturing complex, LX Factory has become the hot spot for local creatives : an absurdly hip mecca of cafés, bars, street art, galleries, tattoo shops, designer boutiques and music venues. Colourful graffiti has grown all over the gigantic walls of the industrial site, giving it its unique vibe and eclectic feel. Part of the LX Factory complex, Ler Devagar library is truly one of a kind. Considered to be one of the 10 most beautiful libraries in the world, its floor-to-ceiling shelves are filled with an incredibly wide selection of books and CD’s. They also have a café where you can read peacefully, chat with friends or simply enjoy a good coffee with a background décor of printing machines. 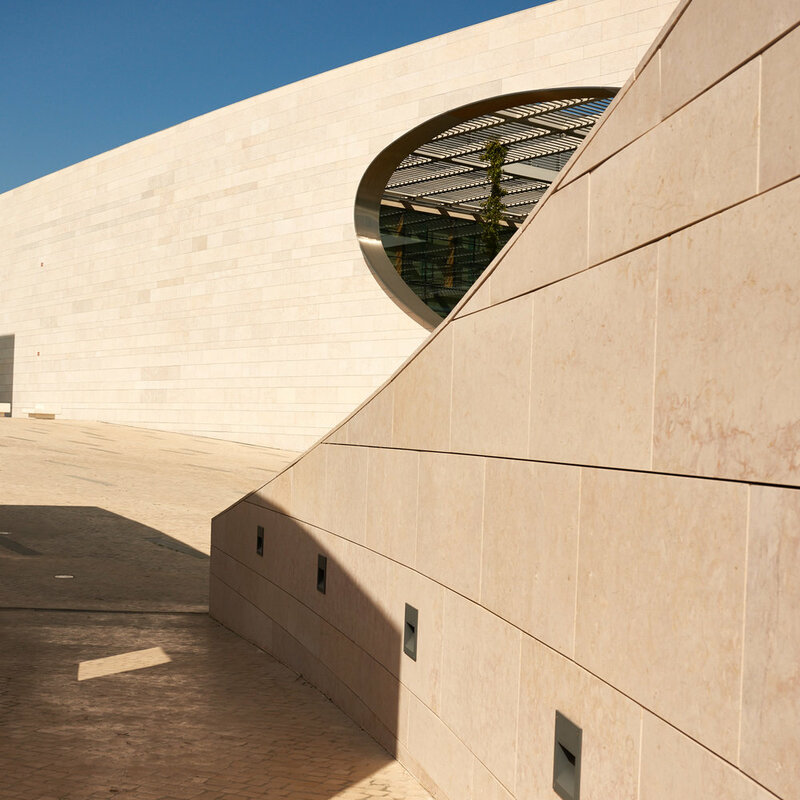 While in the Belem area, take the opportunity to go visit the Champalimaud Foundation. This biomedical research center is an architectural beauty : Pure lines, minimalist shapes and curves facing the Tagus River. Right next to the famous Belem tower, the Foundation is a perfect afternoon promenade. If you’re a foodie like we are – even if you’re not actually – the Mercado da Ribeira is absolutely worth adding to your itinerary. Divided into two sections, the largest covered market in Lisbon offers a space dedicated to buying fresh fruits, veggies, fish and meat, and a new trendy food court area sponsored by Time Out Lisboa. We focused on the market part, where we met Almerinda "the green specialist" who was kind enough to strike a pose with Esther. How to get there ? Lisbon's Airport can be reached via direct connections from numerous capitals around Europe - and among others via Ryanair. From the airport there's a few options to reach the city center: The metro Red line takes you directly from the airport to the center. It's a 30 min ride (1,25€) / The AeroBus makes the connection every 20 minutes (3,50€)/ The Taxi takes you to the city for about 15€ (+1,60€ with luggage). When's the best time to go ? The climate is ideal from the end of april until october. Even during the warmest period of the year the Atlantic winds cool off the city. However, if you want to avoid the crowd, keep in mind that mid-june until september is the high season for tourists. Tram : Beside their cool vintage look, the trams are lifesavers when it comes to going up one of the many hills of Lisbon. Tuk tuk : Probably the most epic way to visit the city, it also allows you to drive through some narrow alleys unaccessible by car like in the Alfama or in some parts of Graça. Uber : Effective and surprisingly cheap, there's nothing like a good old Uber to get you home after one of those crazy southern nights. Now hitch a ride and join our trip on Instagram !